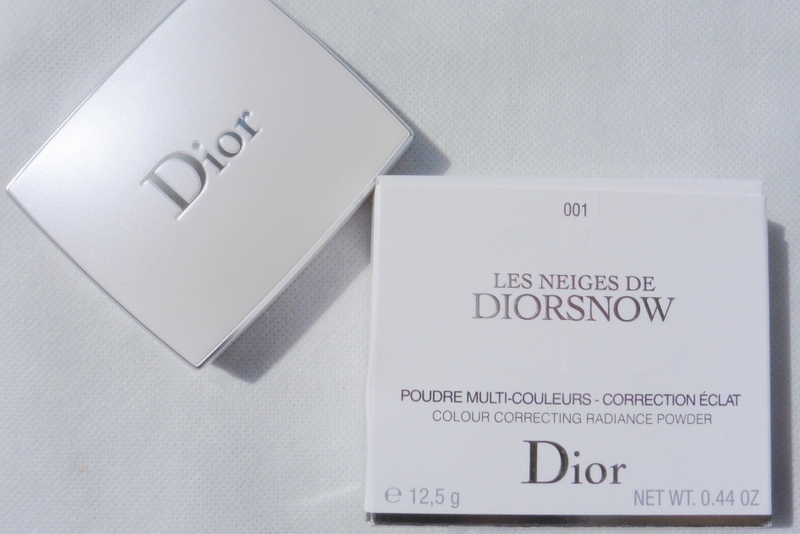 The Diorsnow Rainbow Powder (officially Les Neiges de Diorsnow Colour Correcting Radiance Powder in 001) is an Asia exclusive that Renee brought back from Taipei at my request. I thought this might be of interest because (1) it’s so crazy beautiful (serious makeup p0rn ahead! ), (2) many of you live in Asia, and (3) sometimes Asia exclusives pop up in the U.S., such as during Nordstrom’s summertime Anniversary Sale (although that’s starting July 17th and I haven’t heard anything yet…). Update: The beauty specials for the Anniversary Sale are now up and they definitely don’t include Rainbow Powder. Update #2 (Feb. 2016): An almost exact dupe–in appearance at least–can be found in the Guerlain Meteorites Voyage Exceptional Compacted Pearls of Powder ($179 with the case or $59 for the refill pan). I updated this post with a comparison below. 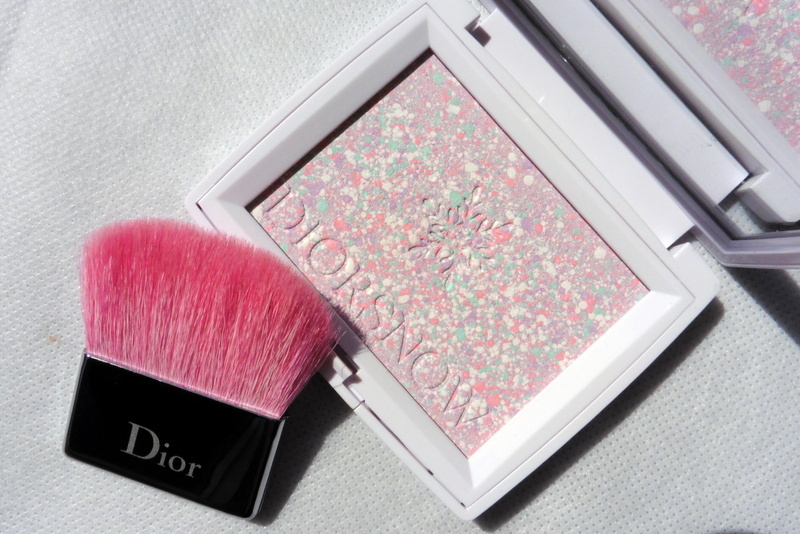 The powder is expensive albeit typical for Dior: $65 USD in Taiwan. So what would already be an overpriced luxury item in the U.S. is a ridiculously overpriced luxury item in Taiwan. 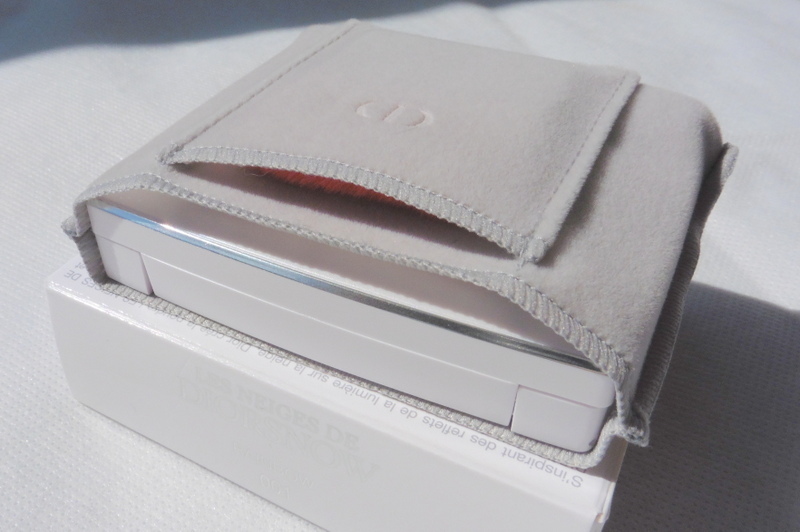 The white compact is subtly pearlized with silver accents. 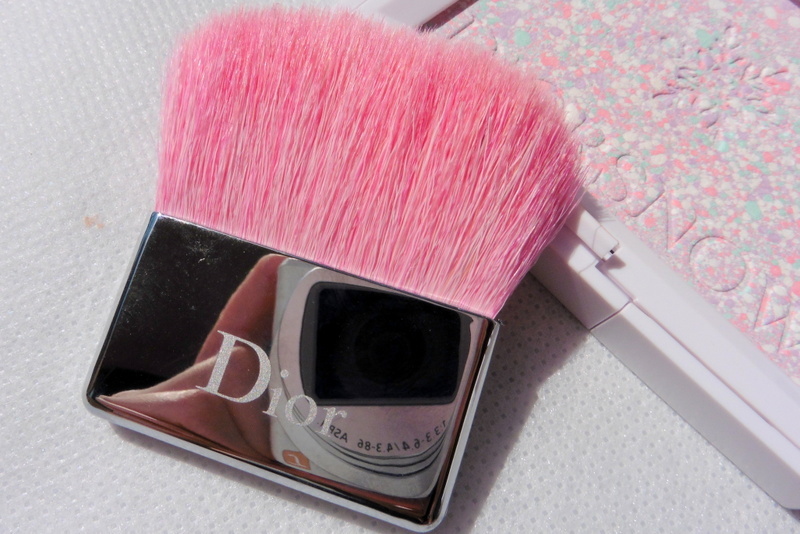 It comes with a soft gray carrying pouch that holds not just the compact but also a pink-haired brush. However, the brush tends to apply too much, resulting in powdery patches. I normally use a synthetic powder brush by EcoTools instead. 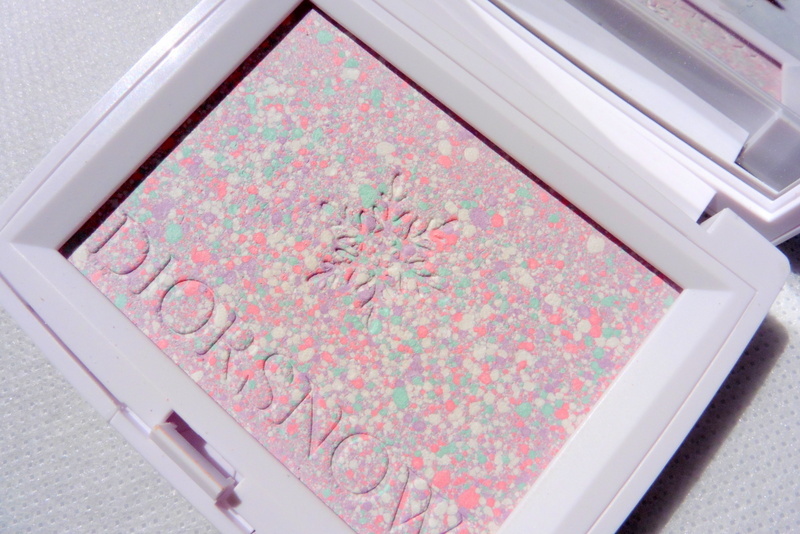 The powder is an enchanting mosaic of white, lavender, blossom pink, and mint. Although each of the colors arguably color corrects for something (sallowness, dullness, redness, etc. 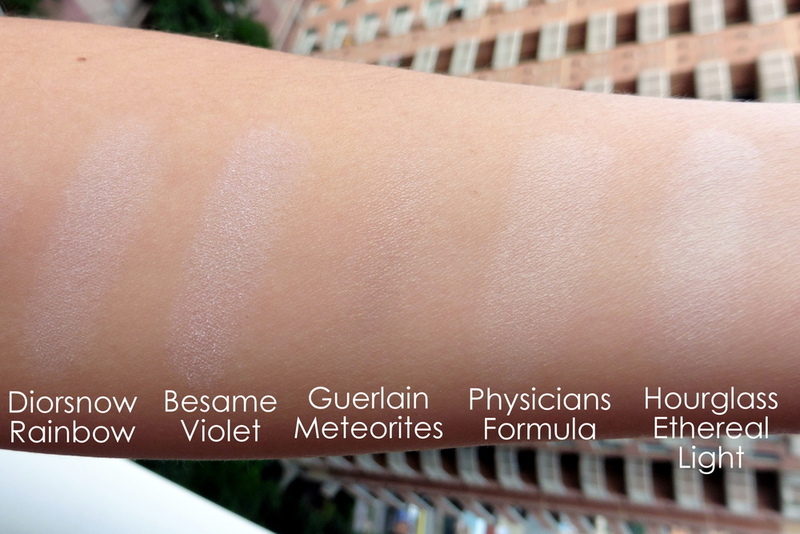 ), the powder translates into a translucent, cool white that primarily brightens the skin and neutralizes sallow tones. It doesn’t really diminish redness. The powder is shimmer-free and instantly mattifies skin and blurs the appearance of pores to create the look of smooth skin. It has decent oil-absorbing abilities, making it a great choice for oily skin and T-zones. On my normal-to-dry skin, however, the effect was occasionally drying, so I dust it on very lightly. The powder is hard-packed, so I run a powder brush over it several times to pick up enough product. 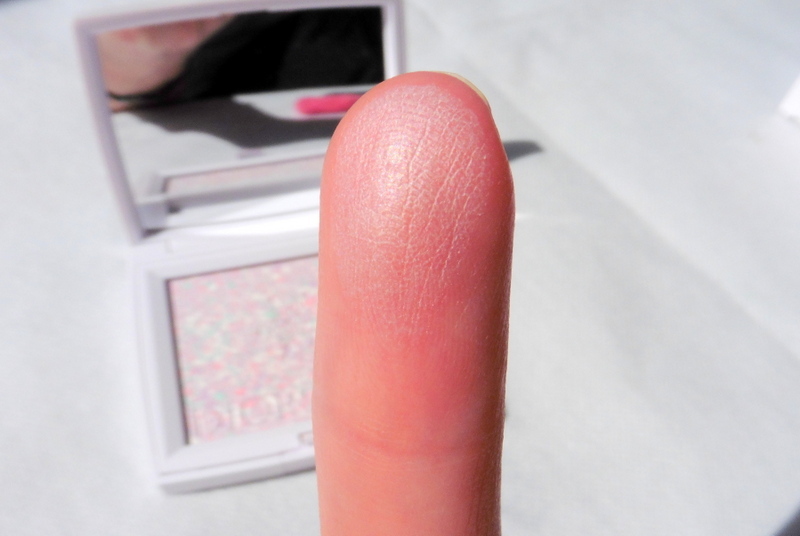 In the swatch photo below, I ran my finger over the powder about 10 times; in normal application, one layer translates to a very sheer application. Sadly, as you’ll see in some of the pics below, I’ve managed to get foundation on it (I think from my sticky cushion foundations). 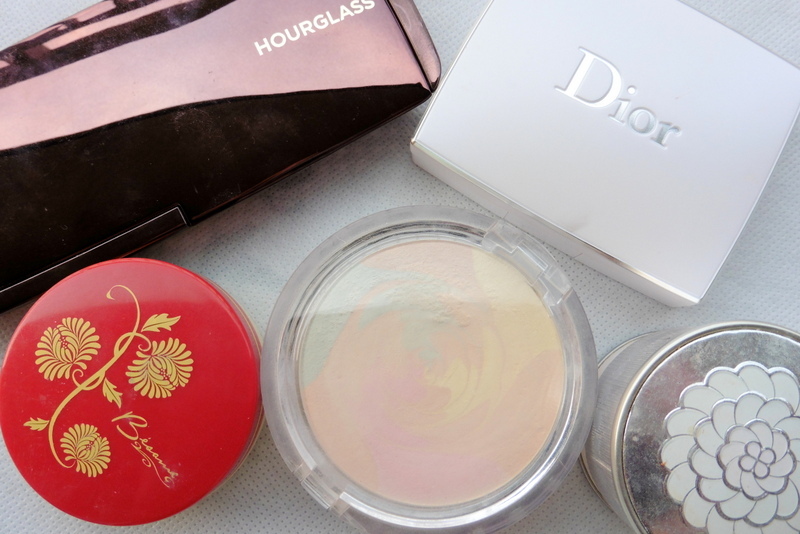 I use Rainbow Powder as a finishing powder after foundation but frequently before blush. Due to its neutralizing abilities, it works well as a base for cool-toned blushes (albeit not as well as lavender blush). Quite comparable in performance to Rainbow Powder, the main difference being that Violet Powder is in loose powder form. Was hard to notice a difference at the end of the day. These are an obvious point of comparison, as many reviewers have noted. 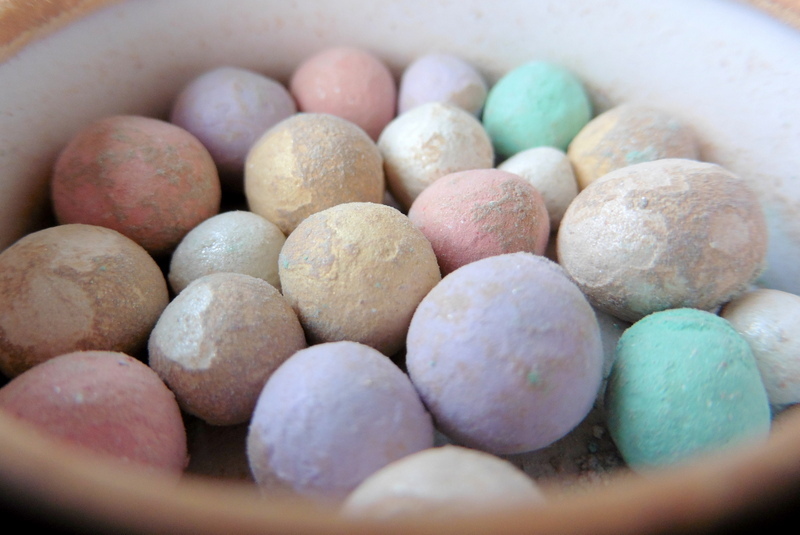 Meteorites leave the tiniest shimmers (visible if you know to look for them) whereas Rainbow Powder has zero shimmer. 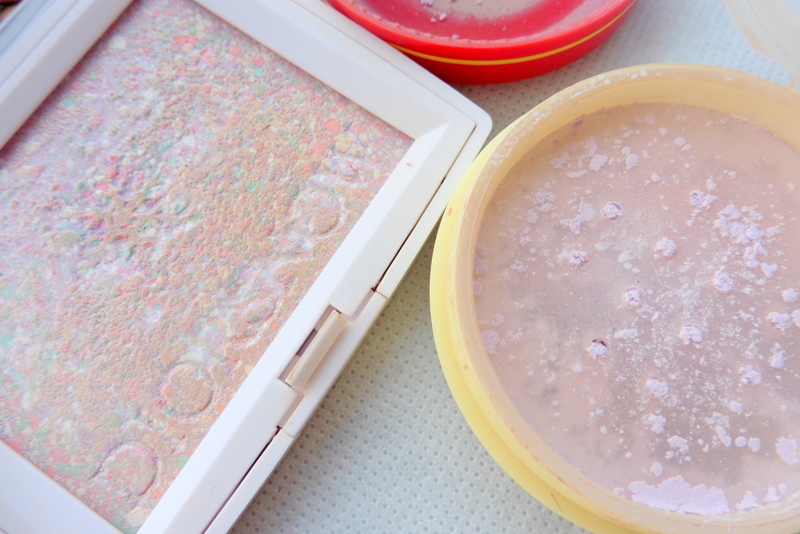 Meteorites only soften shine while Rainbow Powder instantly mattifies; Rainbow Powder also neutralizes yellowness and blurs pores better. 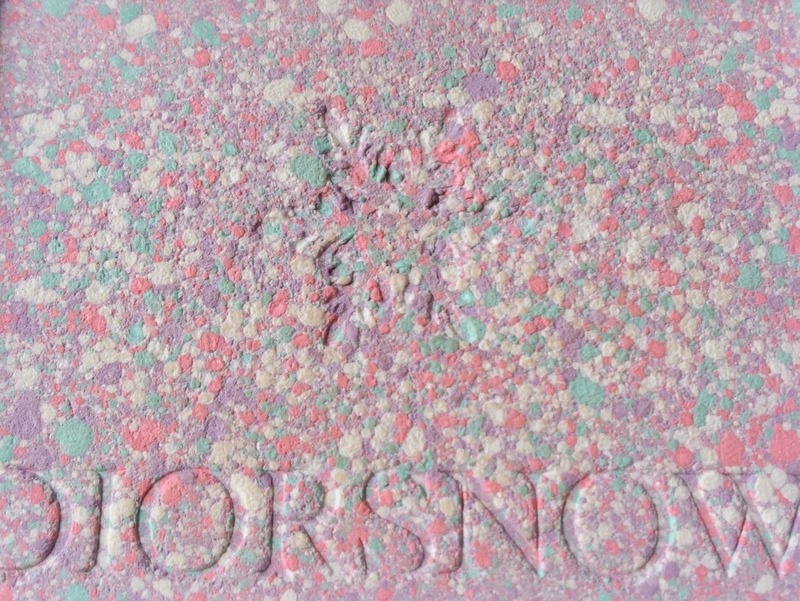 As you can see in the swatches, Meteorites–even swatched heavily with a dense brush–is practically clear compared to other powders. At the end of the day though, my skin showed comparable amounts of oil and shine with the Meteorites side possibly having a bit more glow (not from oil but from the radiance in the powder). Out of all the powders in this post, Meteorites has the glowiest sheen, especially apparent in flash photos. Clarification: The sheen is really only apparent in a heavy swatch. Applied normally on the face, it leaves a clear radiance but not a true sheen (no resemblance to a highlighter). I do not own this pressed powder. 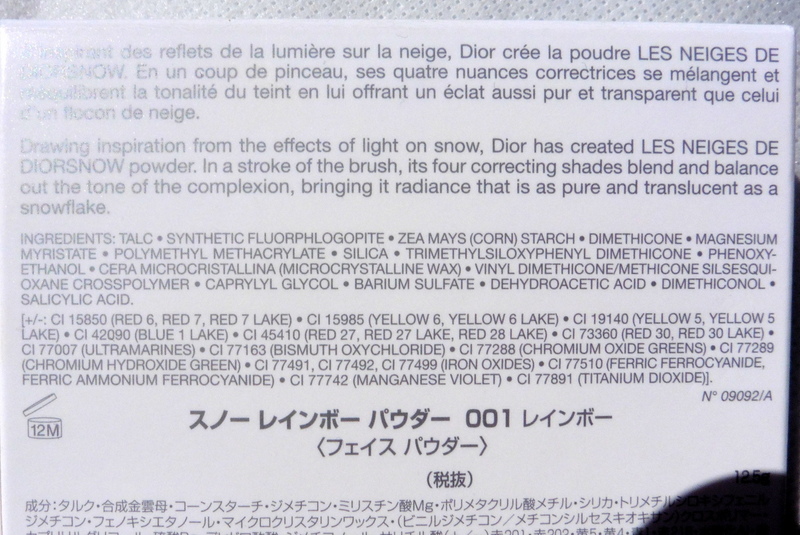 (I refuse to say “compacted pearls of powder.” Really, Guerlain?) But I stopped in my tracks when I saw it online and had to add it to my comparison. 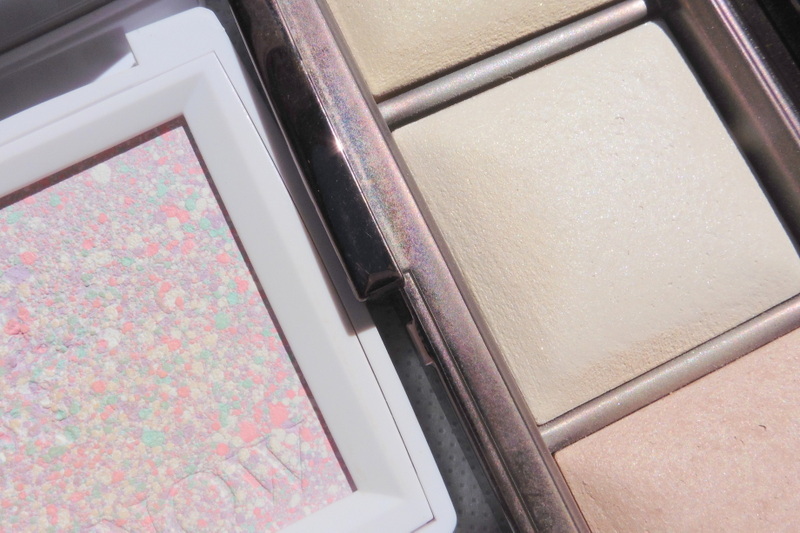 Guerlain’s version purports to be radiant and have strobing/highlighting capabilities, but after reading Color Me Loud‘s review of Guerlain’s version, I think it sounds incredibly similar. Color Me Loud essentially describes it as mattifying and blurring without shimmer and imbuing a subtle lightening effect. Sounds like Rainbow Powder! 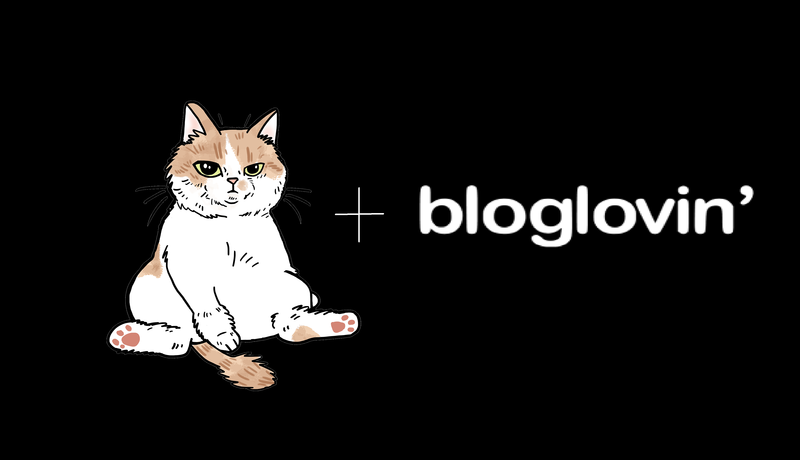 Check out her blog and The Happy Sloths for full reviews and swatches. The most notable differences that I can discern from reviews is that Guerlain’s powder has the trademark Guerlain scent and has champagne specks in it whereas Rainbow Powder is scentless and doesn’t have champagne (any hint of champagne in my photos is foundation residue). Produced a similar effect to Rainbow Powder. However, the texture of the Physicians Formula was a lot softer, making it easier to pick up with a brush but also easier to overapply. At the end of the day, the Physicians Formula side looked a touch more powdery, but that could probably be corrected with a lighter application. Ethereal Light’s texture is softer and more powdery. 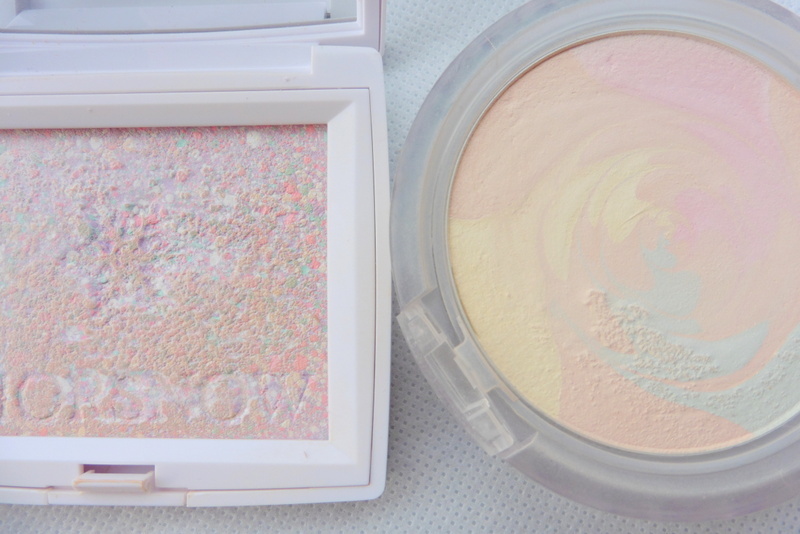 Viewed side by side, it’s apparent that Ethereal Light has a touch of cream versus Rainbow Powder’s stark whiteness. Ethereal Light also has some ultrafine shimmers (they translate to a slightly satin finish on the face) whereas Rainbow Powder has none. 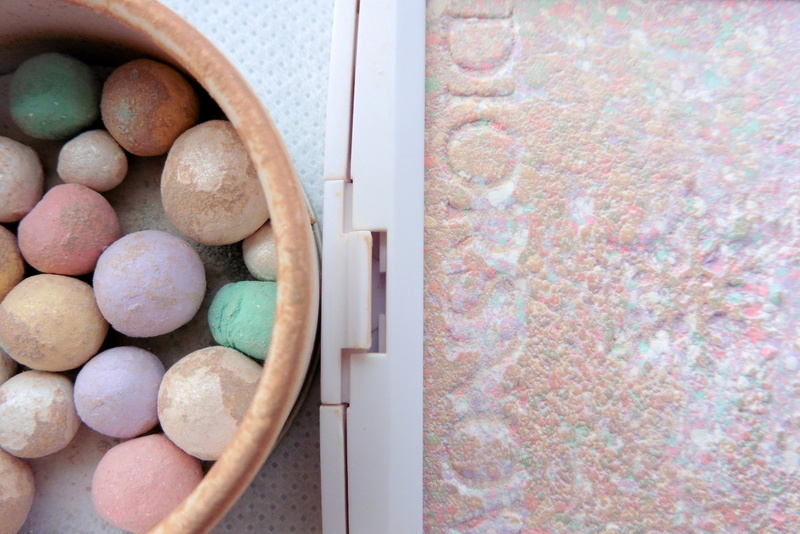 While both powders similarly brighten, Ethereal Light does nothing for pores and doesn’t mattify skin. As the day went on, the Rainbow Powder side looked drier while the Ethereal Light side still looked smooth. I don’t regret purchasing Rainbow Powder and use it frequently, but I can’t say it’s worth going to special lengths to acquire. Depending on your preferences and skin type, one of the other powders in this post might serve you just fine or even better! 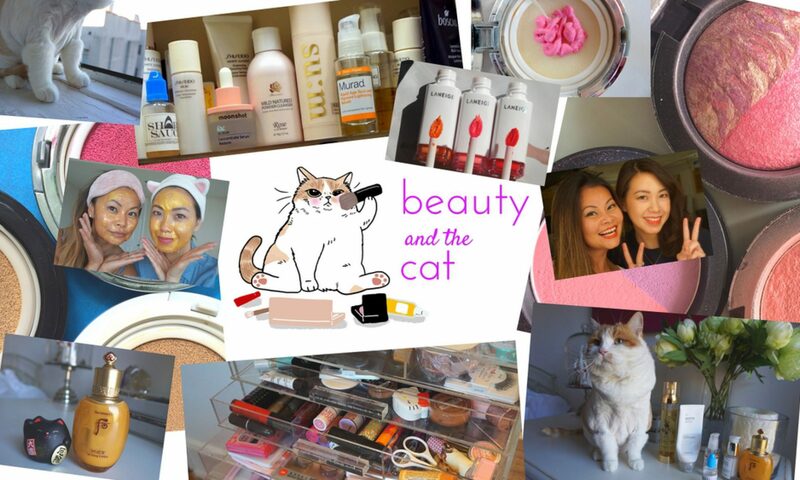 Only one way to find out 🙂 Come to my beauty lending library (it’s like the Kindle lending library but way prettier). Btw, saw that you posted your Missha FTE review. Maybe now you need to upgrade to the big boy (the regular bottle)! 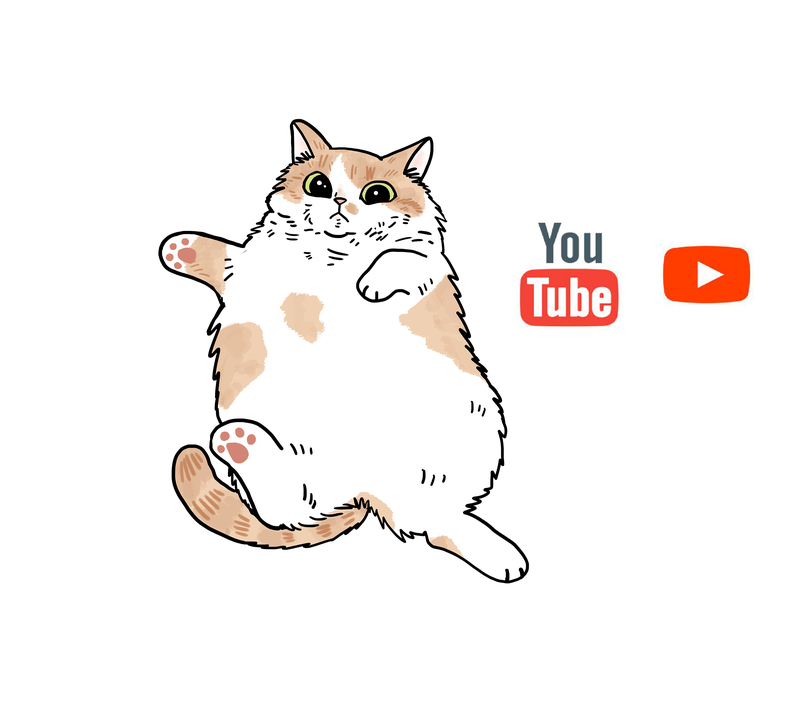 I am going to upgrade. I feel so incomplete when I don’t use it! thanks for the review, especially the comparisons! i’ve been looking at the nordstrom anniversary sale, and i haven’t seen this yet! yeah, i saw them. i actually just ordered from the sale and spent a ton of money hahaha. i’ll have a blog post up soon with what i ordered! Exciting! Looking forward to seeing your haul. Love shopping vicariously through others 🙂 I was eyeing the Guerlain Rainbow Meteorites, but I don’t really need more 😦 The mini size that I already have will probably last a lifetime. Yeah, I have the compact, but I was thinking about it. I wasn’t the biggest fan of the packaging, though, so I decided to pass. Sometimes there are nice Guerlain GWPs with a lower purchase threshold, so I’ll probably save getting the pearls later when they have a better GWP!